Aromatherapy bath oils can be very effective to use for different healing purposes. The skin is the largest organ of the body and when you lie in the bathtub every single part of it has an opportunity to absorb these essential oils. The warm water allows the pores of the skin to open and a process called osmosis draws the oils through the skin and into the blood stream. The aromatherapy bath oils can travel to the parts of the body which require them most. These therapeutic use of aromatic plant oils can be a very pleasant experience. Of course, just as beneficial is the way the essential oils evaporate in the steam, you breathe them, and they travel up the sinuses to the brain. As the brain receives the essential oils it begins to send out different messages and the chemical processes to the body. Using aromatherapy baths oils such as Lavender, Geranium or Chamomile will relax and calm, whereas Melissa, Ginger or Mint will invigorate for a fresh, wakeful day. It takes about 20 minutes for the body to go through the full cycle of healing so you will need to languish in the bath for about half an hour to get the full benefit. 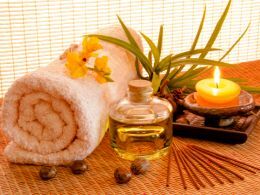 It is often best to start with ready mixed aromatherapy bath oils. Blending is an art which takes many years to learn and often if two oils do not work together well, it is a bit like hearing someone playing a piano badly, the notes clash. When in harmony aromatherapy bath oils have a really beautiful synergy, their energy is far stronger than using just a single oil. It is important too, to read safety data before choosing which oils to use in the bath. Many can be irritant, and so do not make good aromatherapy bath oils. Lemon for instance is a every uplifting oil, but lie in that for 20 minutes and it may as well have been a bed of nettles! Use Geranium, Palma Rosa and Petitgrain as aromatherapy bath oils to lift stress and make you feel happier. Stress just disappears with these, especially good for premenstrual tension. Clary sage is like being hit over the head with a sledgehammer at bed time. It also is antispasmodic which means it will calm cramps or twitches, a massive relief for restless legs. Tea tree (often seen by its Latin name Malaleuca Alternifolia) is a powerful weapon if you feel a cold coming on. Using it as an aromatherapy bath oil means you can load it into your system to kill any virus threatening to overtake you. Eucalyptus is the obvious and correct choice for a stuffy nose, but Myrrh is even better. For children who need calming after an upset, Myrtle Oils is wonderful, giving them a lovely peaceful sleep. Myrtle is a great aromatherapy bath oil to keep as a standby for coughs too. Use essential oils in small quantities. 5 drops of the concentrated essences in a bath of water can often not seem enough, but rest assured it is plenty. The body takes the properties it needs from the aromatherapy bath oil, any more will just be wasted.